Itami, the spirit of the black blade during shikai, is a trickster and plays foul. She loves to sabotage and wreak havoc. She even tries to bully Kisho whenever he's in the inner world, though all of this is her way of showing affection. Tetsu, the spirit of the white blade during shikai, is the opposite of Itami. She's kind hearted and dislikes violence. She makes it her duty to dispel the evil in people, even attempts to do so with her sister, though she fails. 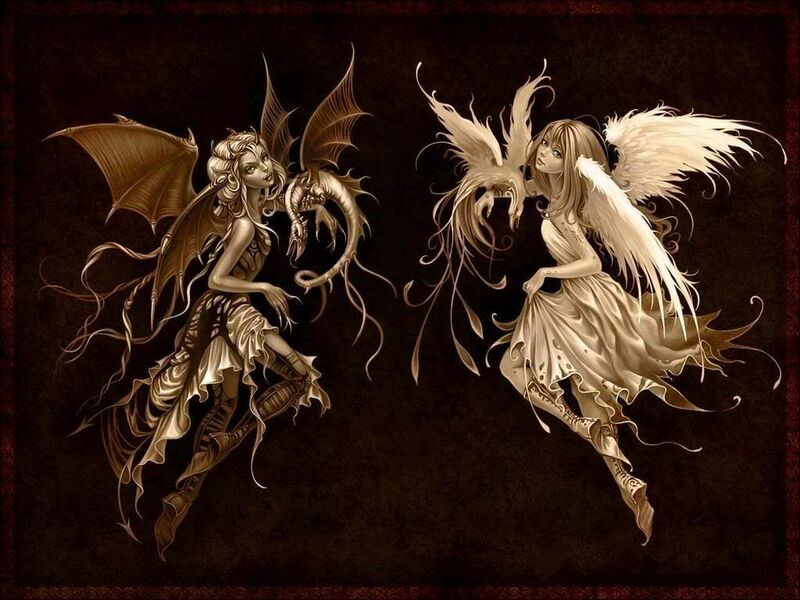 When needed they work together, in great synchronization, despite their differences. The inner world is an abandoned amusement park, full of nightmarish rides, and blissful attractions. It's where Itami and Tetsu play together. Some areas of the amusement park being greyish and lifeless, while others are full of color and dreams. The ground is a sandy and of white color. Though no one is there, you can hear screams and laughter echoing throughout the amusement park. Itami can usually be found sitting on the edge of the roller coaster tracks, at the peak. Tetsu is not too far from there, standing over the ferris wheel. All of the rides and attractions are active though no one is there, other than Itami and Tetsu. It is warm, yet windy in the area. With a mixture of smells from burnt popcorn to sweet cakes. When sealed they take the form, of a single katana. The hilt color is white with black diamonds. The blade being made of strong iron that had been compacted into a somewhat thin, sharp edge. It is 3 and a half feet in length. Release Phrase: "Show them the truth..."
The single blade glows white then sparks black. Kisho, with both hands, pulls the blade in opposite directions, causing the blade to phase. The single blade is now, 2 twin katanas, one black and one white. Both blades are made of the same structure as if they were sealed and are both 3 and a half feet in length. The hilts are now a solid black and a solid white. One blade contains a pure, white glow, while the other has a black aura with black sparks. The black blade also has a faint black smoke coming off of it. Each blade has it's own sheath, matching their colors. 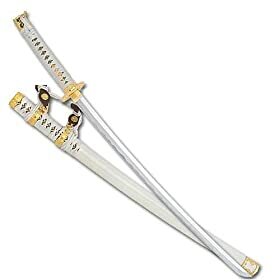 The hilt of the white blade contains a gold lining of diamonds. The black blade is solid in color with a gold ring where it connects with the actual blade. Shikai Ability: In shikai each blade has it's own abilities and properties. The white blade(Tetsu) has healing properties. It heals using its reiatsu to increase cell regeneration. It can be used to heal other people as well. It can heal 4 times before a 3 post cooldown. Healing cuts and stab wounds takes about 1 post, healing vital organs or severed limbs takes 6 post. The black blade(Itami) can release various poisons into the air that have a number of affects(Paralyzation, Cut Senses, Hallucinations, etc...). Its standard poison, cuts the opponents sense of touch, causing their bodies to become sluggish and numb. The poison can be released as a purple gas or can be leaked off the edge into the opponent's blood stream when cut. This poison takes effect within 1 post and usually last for 1 post, with a 2 post cooldown in between use. Other poisons are only used in techniques. During shikai, the blades add to the user's spiritual power, boosting vitals and strength. Effect: The Black blade(Itami), when swung at the opponent, release a quick burst of a sweet-scented, dark blue toxin in the air. The toxin will flow into the air waves of the opponent and into the brain, taking affect instantly in the next post. It cause the opponent's muscles to painfully contract, paralyzing them for a brief moment. During the brief moment of paralyzation the opponent will see the last action that took place(any actions, seen by them, in the previous post, up to the swinging of the black blade) . Though this hallucination affects the sight, their other senses will be unaffected. Effect: Using the white blade(Tetsu) reiatsu, Kisho fires a concentrated beam of golden light into the opponent. The attack deals moderate damage, but has a unique side effect. It overwhelms the target with emotions of deep regret and remorse. The more dark, or evil, the opponent is then the greater the effect. This effect greatly changes the opponents sense of judgment and moral standards, causing them to behave in awkward ways. Duration/Post Usage: Side effect last for 2 post, 3 post if they are of hollow/arrancar nature. Preparation Posts: It takes 1 post to concentrate the reiatsu for the beam. 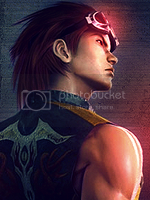 Effect: The reiatsu of both katanas infuse with Kisho, granting him a boost to his body. He heals 50% quicker than normal. His speed, reflexes and strength are increased 50%. During this time, both sword's aura's mix and glow together all over his body. Your healing thing. Make it like 6 posts to heal vital organs and severed limbs and this is approved.